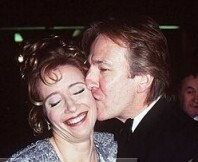 Weirdest Alan Rickman photos I've found on the net. 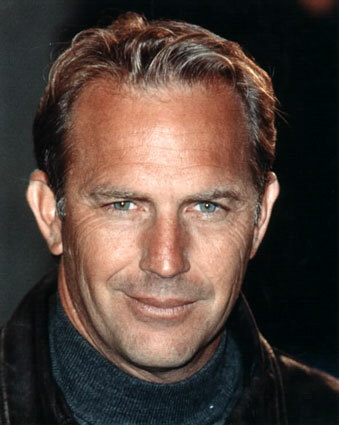 This page is all in the name of good fun, and we know that Alan is the most handsome man ever to have graced this planet, so I don't see any trouble in posting his occasional... erm, weird photos. 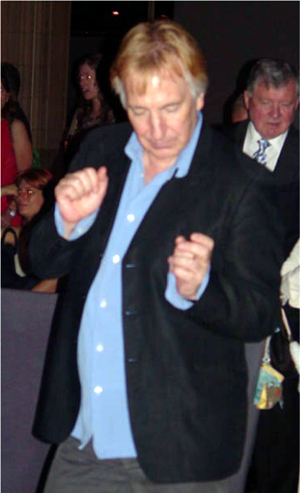 Rickman attempts to get jiggy wid it as a bloated-looking grandpa checks him out in the background. "Mah humps, mah humps, mah lovely Alan lumps..."
Bah! 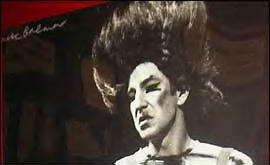 Alan Rickman wins the award for scariest Halloween costume 2007. I know you guys see it and don't want to admit it, but yes, his fly is halfway open. Now if we can only just pull it down a little... okay, I'll stop. "Subscribe to TiVo and recieve a $50 voucher!" 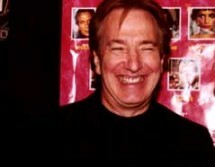 From the expression on his face, I, personally, don't believe that Mr. Rickman did. 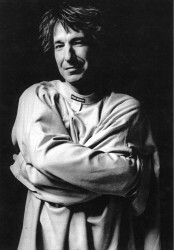 Alan in a straightjacket. I'm guessing this is what happened to him after he discovered the beauty and grandeur of this website. 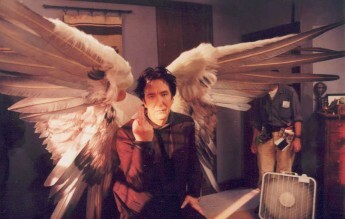 The Metatron, Voice of God, flips off the camera. What a day. I'll buy lunch to whoever can tell me what the hell is happening in this picture. 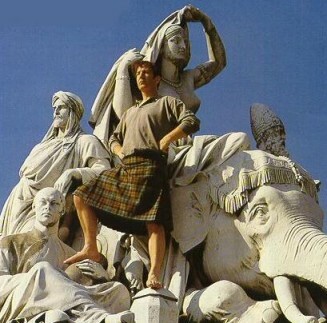 Alan wearing a kilt. And showing off his beautiful feet. He has flat feet! Yes, you really needed to know that. 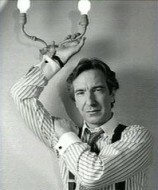 What happened to discipline, Professor Snape? 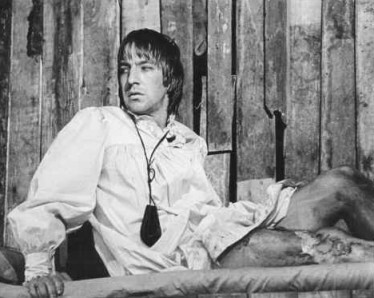 Alan Rickman and Helen Mirren asleep while practicing for Antony And Cleopatra. 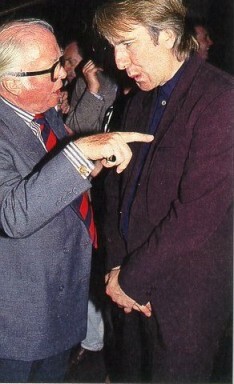 Here is Alan with actor Sir Richard Attenborough. I am beyond words. A broken leg, no pants, and a sixties bowl haircut! What more can a man want? 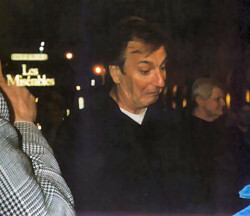 Alan at the Captain Corelli's Mandolin premiere. He seems curiously jolly. 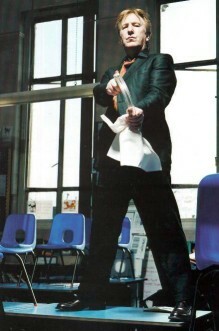 I love his flailing arms and completely devastated expression. Which lamp designer designed those things? Where are the lampshades? 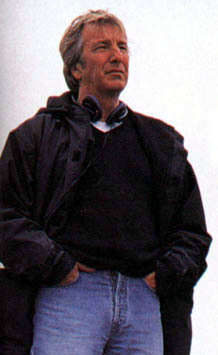 What is Alan doing? 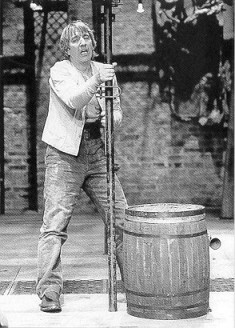 Where are the damn lampshades! His nose is smushed. Just to state the obvious. 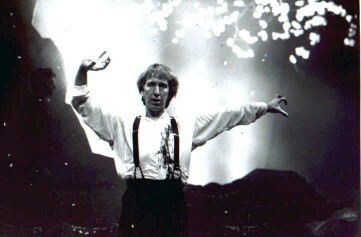 This has got to be the weirdest Alan pic. I mean, what's he doing? Sharing his life story with the dog? He's got all of us lined up just to meet him for one second, while he goes and has a nice little chat with the dog? I mean, look at that dog! He's all, "Nyah! Get away from me, stranger!" Ungrateful mutt. 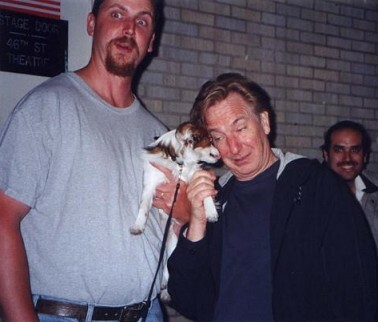 This has to be not only the weirdest Alan Rickman pic, but the weirdest pic in the world. 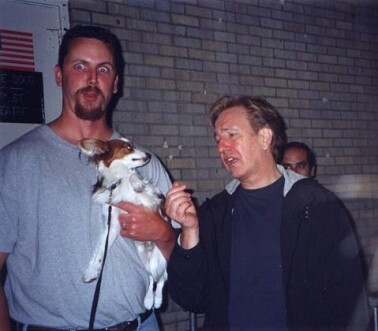 What is he doing with that dog? And who is that dude grinning behind him? And why, oh why is that man's eyes opened so large? 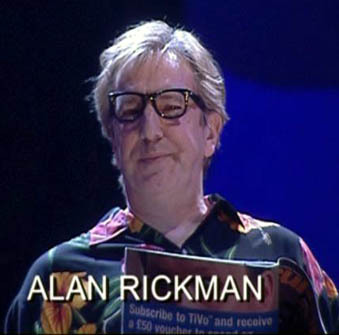 Back to The Slightly Weird Alan Rickman Fansite.